Although the You Are Hear project has finished, you can still sample some of the treasures of the Essex Sound and Video Archive at a site near you. Find your nearest listening bench or audio-video kiosk from the list below. You can also read more about the listening benches on our Essex Sounds website. Our touring touchscreen audio-video kiosks play a selection of recordings from the Essex Sound and Video Archive. The tours have now finished, so the kiosks have moved to their new homes in our two Archive Access points: at Saffron Walden Library and Harlow Museum. We also have a permanent kiosk in the Reception area at the Essex Record Office. Have a play the next time you visit! 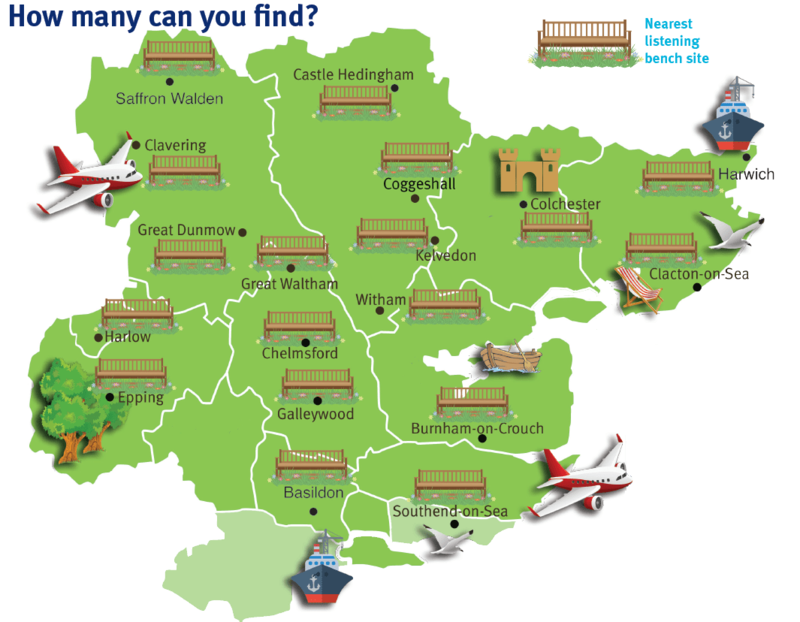 Our listening bench tours have also come to an end, but you can still find the benches in Essex! Find your nearest bench from the list below. See if you can visit all the benches! Download this map to help you find them. Send us a picture of yourself with each bench, and tell us which sound clip was your favourite. Get in touch with your #benchselfie through Twitter, Facebook, or e-mail. Hi. This project sounds very exciting! I should like to find out how much funding is needed for a listening bench – I am a local councillor in Oxford. Please can you send me a contact who can give more information? Many thanks. Hello, I am also interested in installing listening benches in our local community as part of our WWI Remembrance project. Please can you send details of cost and a supplier? Thank you. I am contacting you on behalf of Little Baddow History Centre, to find out more about the Listening Benches and possibly get involved, using our sound archives. Hi, i am very intrested in the process of getting a listening bench installed on our green open space in loughton, how can start this process ? Thanks for getting in touch. We have just responded by e-mail; let us know if you do not receive this. Hi Boreham Parish Council would love to fund a listening bench in our Parish. Very interested to hear of your project, are you able to advise us on the best way to approach this please? Thank you for your interest. Can you please e-mail us at info@essexsounds.org.uk and I can give you more details?